Calls to these wireless handsets, within a provincial area, are considered local connections and aren’t charged by the minute. The Landline Plus user is only charged by the minute for outgoing calls, not incoming ones. These handsets can also send and receive SMS messages. PORTABLE LANDLINE. 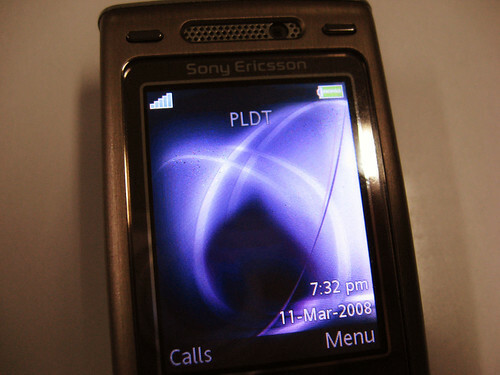 The PLDT Landline Plus Prepaid SIM running on the Sony Ericsson K8001. With the SIM, calls to this phone from a landline, whether Globe or PLDT, are considered local connections and are not charged by the minute. You know the SIM is active by the operator logo: it says PLDT instead of Smart. Click on photo to enlarge. But the availability of prepaid plans is just an undercard (in boxing parlance) to what will be launched through TV ads during Manny Pacquiao’s fight this Sunday: Landline Plus is going GSM SIM-based. It can now be used with any GSM mobile handset.